Crawley v. MD Laser Medicine & Surgery, Inc. This is a cosmetic surgery medical malpractice case filed against an Eye Laser Surgery Center by a woman in Howard County. This case was filed in Health Claims Arbitration on August 19, 2016. It is the 415th medical malpractice case filed in 2016 in Maryland. 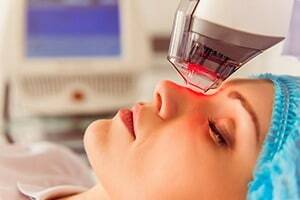 Plaintiff is a patient of defendant doctor and facilities for several months before undergoing a laser peel and fractional resurfacing performed by defendant doctor. Plaintiff claims that during the procedures, defendants deviated from the acceptable standard of care. Plaintiff alleges the procedures were planned negligently, in that they required deep treatments which were not required, and a plan to treat areas of her face which did not require treatment. Further, they scheduled two treatments on the same day, which she alleges was excessive. As a result of the defendants' negligence, plaintiff alleges she sustained severe partial thickness and full thickness facial burns, leaving her with permanent scarring and ongoing medical care required. Cosmetic surgery cases are difficult to prove even when there is negligence. Cosmetic surgeons do not get sued often and when they cases do go to verdict, the doctor usually wins. This case has all of the earmarkings of a losing claim: (1) cosmetic surgery case, (2) a lack of clearly defined malpractice, (3) filed close to the statute of limitations, (4) without an expert report, and (5) in an extremely conservative jurisdiction (Howard). If there were a secondary market where you could bet for or against cases, you would be the defendant in a big way on those facts. Laser resurfacing is a technique that uses light energy to resurface the scarred areas of a patient's skin. It is typically performed in an office facility and requires local or topical anesthetics instead of general anesthesia. The hope is that the resurfacing will smooth scar tissue and blend it into the more normal surrounding tissue. The Plaintiff had fractional laser resurfacing which ostensibly has less downtime and risk of more traditional laser surgery. Many laser surgery cases stem from the laser reactivating herpes virus infections. You can get information on the settlement value of facial scar cases on our website. MD Laser Medicine & Surgery, Inc. If you have suffered a very serious injury as a result of the negligence of a doctor in Maryland or Washington, D.C., Miller & Zois can help you get the justice and compensation you deserve. We have a very long history of results in medical malpractice cases, earning large verdicts and settlements. Call Miller & Zois today to speak to a caring medical negligence attorney, at 800-553-8082, or go online and get a free case review. We handle only serious injury and wrongful death claims.